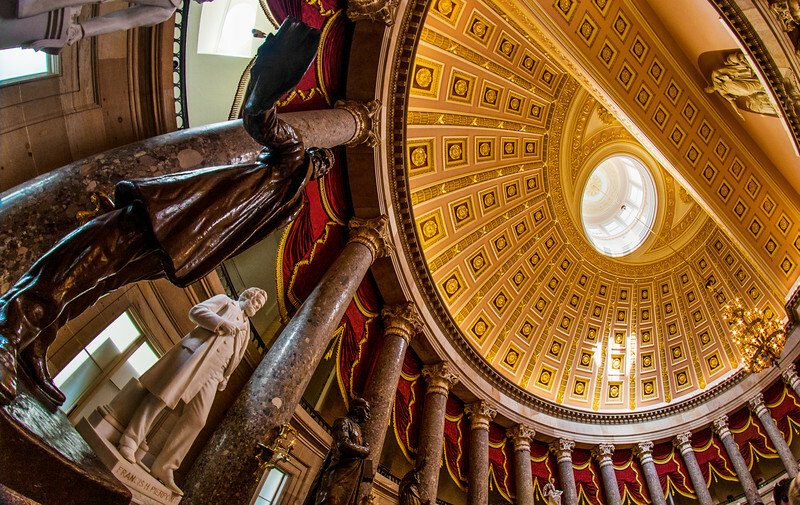 The U.S. Capitol tour is free, so in terms of whether it’s worth it, the question is really whether it’s worth your time when you visit Washington, D.C. given the number of other things to do. This post will cover that, as well as tips for taking the tour (since there are a few different ways to approach it), and what you’ll see if you choose to go on the tour of the United States Capitol Building. 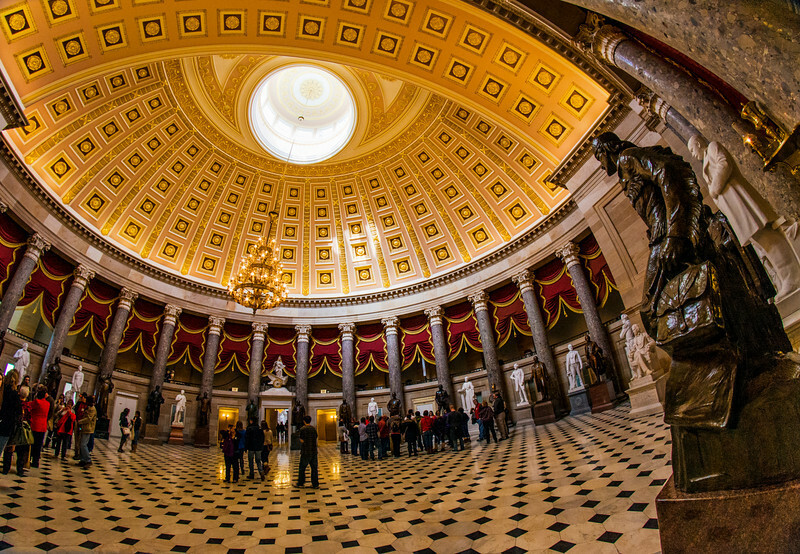 There are a number of ways to book the United States Capitol Building tour in advance, or you can show up on the day of via the public ‘walk-up’ line. As you can imagine, showing up on the day of without reservations is the worst approach. You’ll probably be able to get tickets (except during the busy spring break or summer seasons), but why hassle with waiting for an opening and having to get the tickets? The ways to book the tour in advance are going through the offices of your state Representative or Senators, or reserving a spot yourself online. You can do either of these things via the internet. We highly recommend going through the office of your Senators or Representative, as when you’re contacted by a staff-person, you can also obtain gallery passes for the Senate or House of Representatives, if they’re in session. The other big benefit of going through a Representative or Senator is that one of their interns conducts the tour, and generally these tours are more intimate. We did our tour with a large public group, but we saw the smaller groups in the rotunda and throughout other rooms. Although they went to the same places as us, it definitely looked like a better experience. Before you start the tour, make sure to check out the Exhibition Hall in the Visitor’s Center. There are actually several fascinating displays in here, as well as a few cool statues. We actually found this area to be one of the highlights of the United States Capitol Building. The tour itself starts with a short video. The video is okay–it’s basically a quick look at the United States’ establishment of a representative democracy, and what that government means to its people. It’s a well done video, but I can’t say it’s especially memorable. We went with a friend who works for the White House; he had been on the tour before, and it sounded like the guides vary in quality. (A quick skimming of Yelp suggests the same.) Ours was fine, although it felt like the guide had memorized a script and was reciting that from memory. The guide wasn’t necessarily monotone or anything, but there wasn’t any real personal incite, anecdotes, or anything else. Most questions were met with speculation rather than actual answers. The rotunda itself is amazing. Definitely the highlight of the tour, and something that must be seen in person. Regardless of the rest of the tour, it was absolutely worth it to take the tour just to stand under that rotunda. The Architect of the United States Capitol website has some interesting history. There are several statues of representatives from the 13 original colonies and some beautiful paintings. The most beautiful aspect, of course, is the inside of the rotunda. It’s probably the closest we get to Versailles in America. Be prepared to stare up a lot! 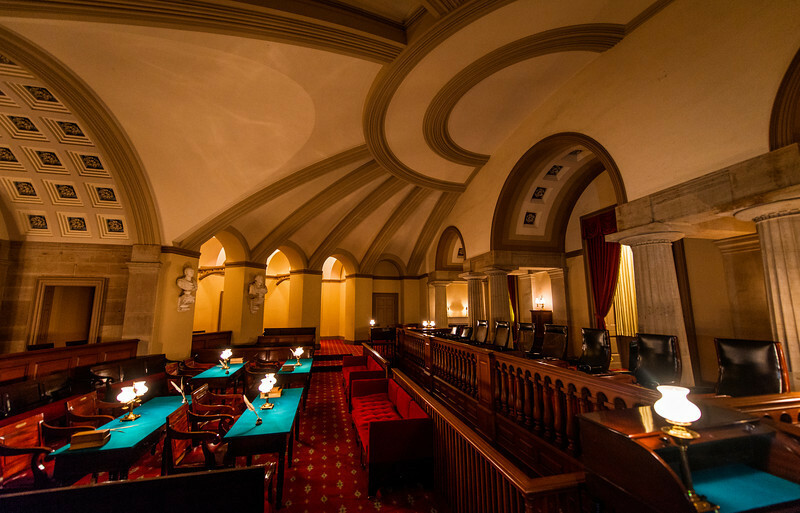 From there, the tour also went to the Crypt and a number of rooms that have been “outgrown,” including the old Supreme Court Chamber, old Congressional chambers, and outside some old (and active) offices. These areas were interesting from the perspective that they underscored how the United States has grown, and some of the history of our government, but there was neither any substance to this portion of the tour, nor were these areas all that elegant or charming. This part of the tour was sort of just a “go inside a minute, look around, hear some superficial facts, move on” type deal. The entire process of the tour, including going through security and waiting for it to start, takes about 1.5 to 2 hours. Probably more if you go on a busy day or have to wait a while to get a standby slot. To save time, we ate in the U.S. Capitol Building cafeteria, which was nothing memorable…just a basic cafeteria. Definitely much better options in Washington, D.C.
Again, the tour is free, so the question of whether it’s worth it is purely in terms of the value of your time. There’s a lot to do in Washington, D.C., so if you’re time is limited, you might wonder if this is worth it. We did this tour as well as a public tour of the White House and a private West Wing tour of the White House, and we much preferred the White House tours. By comparison, the U.S. Capitol tour felt mediocre and cursory, with too much of an emphasis on the various statues around the building, and not much else. The experience wasn’t helped by our tour guide, who wasn’t very engaging, nor was it helped by the awful headsets we were provided. With that said, we still felt that this tour was still worthwhile. Washington, D.C. has some beautiful museums and monuments operated by the National Park Service, and while museums like the Smithsonian are world-class and not really comparable to anything else in the nation, there is only one US Capitol, so visiting it is more of a ‘distinctly Washington’ experience. It’s a beautiful building with amazing architecture and history, and seeing that alone is an incredible experience, regardless of how the tour to see it is packaged. 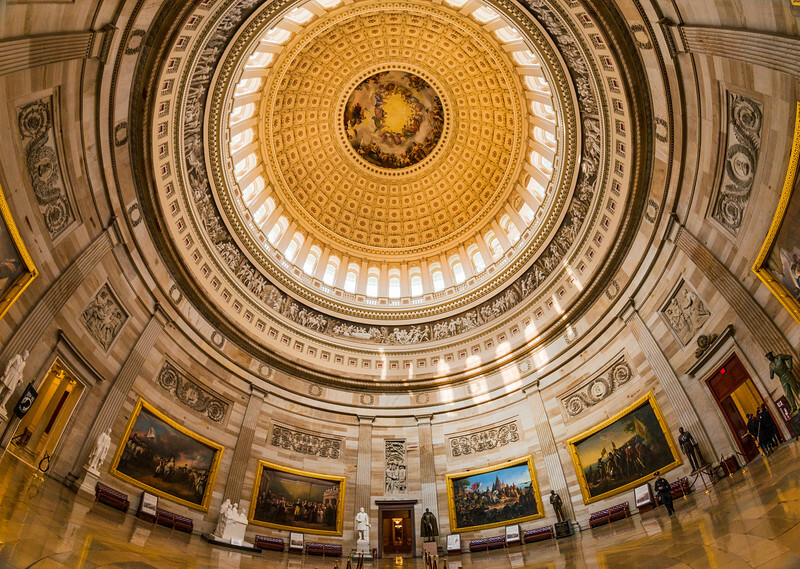 If you’ve done the U.S. Capitol Building tour, how would you rate it? Was your tour guide better than ours? Was it worth it to you? Please share your thoughts in the comments! 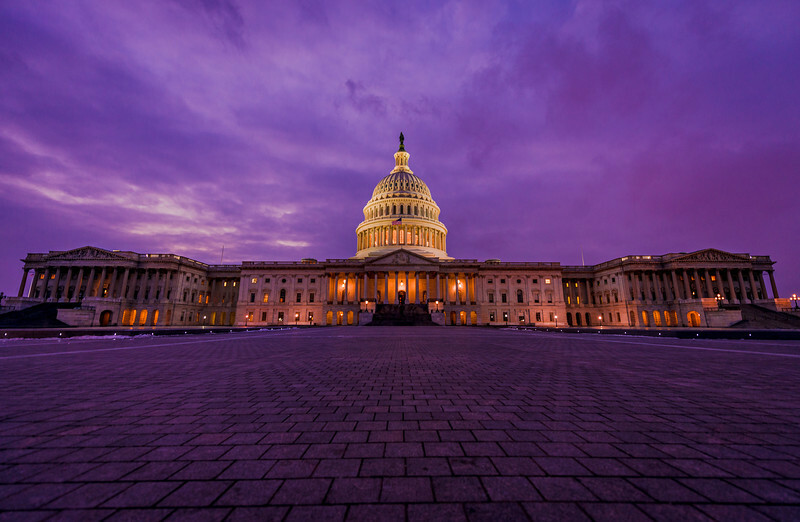 https://www.travelcaffeine.com/wp-content/uploads/2014/03/united-states-capitol-dusk-front-copy.jpg 1305 2000 Tom Bricker https://www.travelcaffeine.com/wp-content/uploads/2017/08/logo.jpg Tom Bricker2014-03-12 19:16:422014-03-12 20:56:34Review: Is The US Capitol Building Tour Worth It? Thanks for this post review! 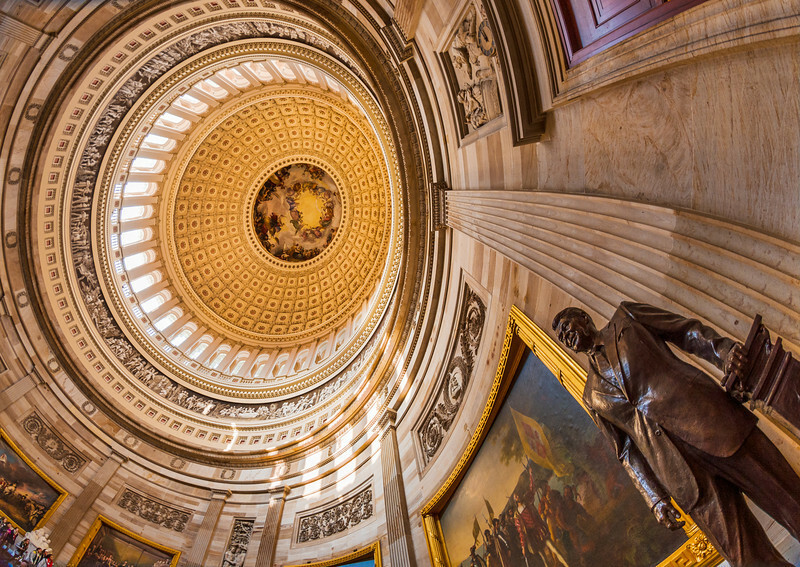 Statuary Hall was the original chamber for the House of Representatives. As the country grew congress outgrew their building, so the new House and Senate chambers were built. The Rotunda is now on its 3rd dome. The first two were much smaller and made of wood. One was burned by the British in September 1814, and the other burned from a fire that started from a whale oil lamp. The current dome was championed by Pres. Lincoln, who said it would become the symbol of freedom and democracy around the world. He could often be found climbing the scaffolding to observe the construction progress. The smaller groups that are led by interns are definitely more ‘colorful’ and filled with tall tales. The professional guides are the way to go. Thank you for this review! My husband and I are going to be taking this tour next week and appreciate your insight! I was wondering if you have any advice on the appropriate attire to wear for this tour. I saw that you and Sarah looked very professional and I wanted to ask your advice. We don’t want to disgrace our country by looking like slobs! I think it is going to be quite hot while we are there and we will probably wear shorts or cooler clothing for most of the sightseeing, but we weren’t sure what was appropriate for this particular tour. Thank you! No shorts. A light airy dress. I’m writing a lot, but I gained so much value from this tour. It should be known that my companion and I are both history and political junkies, so the significance of our time at the Capitol may weigh more than for others. However, I think that if one has the time to take the tour, I would recommend it. Some on the tour had only a basic understanding of government, but they all seemed to take away so much information and appreciation for the building, its history, and the legislative branch. We originally planned on spending only an hour or two at the Capitol, but we ended up staying there for half our our day. As a history buff, I expected to know most of the content, but I was wrong. I learned so much from the tour. Also, each state in the Union sends two statues of native sons to the Capitol. We had a great time seeing ours, as well as others! This portion of the tour is highly interactive between guests and the docent. I was surprised to learn the tour was more than just facts, but an actual conversation. They also take you to the old House chamber, where you can see markers of where former Representatives sat. Lincoln, being one of them, had a spot in the very very back, which shows the lowest rank or importance. He rose from the very back of the House to saving the nation. It was truly magnificent to not simply understand this fact, but to see it represented in a physical space. We spoke to one of the volunteers (who helps direct tourists) and he encouraged us to sit in the gallery. We originally didn’t build this into our plans, but turns out, the House was voting on a bill and we felt this was a unique opportunity. We saw them discuss/debate the bill and then vote. Since there was a vote, almost all Representatives were present. We saw EVERYONE! After that, we went to sit in the Senate gallery. There was no vote occurring, so there were never more than two people in the chamber at the same time, but some major Senators did come in to get things off their desk. Even if no one came in, it would have been ABSOLUTELY worth it. It was very humbling to be in the same room as so many important figures in American history. If you’re limited on time and are trying to decide between the branches of Government (White House, Supreme Court, Capitol), I think the Capitol is the most active and there is WAY more to do and see. You’re limited on your White House tour to only a number of rooms that you’re moved through. The Supreme Court is almost a solemn event, where people spoke in hushed voices. You’re able to sit in the actual room (which is breathtaking), but you’re limited to a 30 minute lecture and a self-guided museum tour. I thought the Capitol has the most to offer in terms of activities. Bare in mind, the Capitol is connected to the Library of Congress, so you can check both off your list in a short time period. This is also helpful if you’re touring on a cold day, as you won’t need to leave the building to get to another. If you have the time, I recommend taking the tour. Even if you don’t take advantage of everything the building has to offer, the tour is worth it. Gorgeous photos as always Tom. I went on this tour back in 2006 before I was using a DSLR and before I had any photography skills to speak of, so my photos don’t do it justice like yours do. It’s been awhile since I’ve been to DC, but I’d really like to go back and do this tour again. I agree, the rotunda is simply stunning. Well, if it makes you feel better, I wish I would have used lenses besides just my ultra wide angle and my fisheye. Maybe gotten some shallow depth of field stuff of the statues. It seems like no matter what photos I get, I’m never satisfied. Pretty common feeling in photographers, I’d imagine!